Harry is a dog boy, or a boy dog (? ), whichever you prefer, but he owns a dog himself. Ehh, kind of weird? Well, that's not much out of the ordinary give that this canine human prepubescent given that most of his friends are a wolf, a cat in a blue overalls suit, a red parrot of sorts and so on. 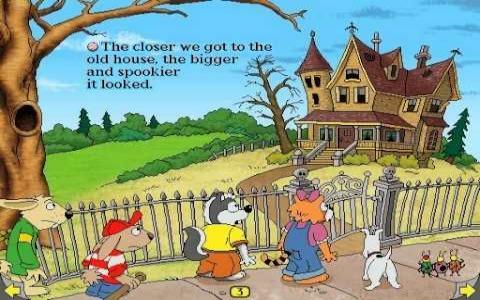 Also, his dog looks a bit like Tin Tin's dog, but then again, if you pay close attention to the graphics of this game you will not be able to focus on the real action of it all; and that is based o the fact that Harry and the Haunted House is a type of edutainment that wants to teach small children to read. It tells stories that are voice narrated while highlighting the writings that stand for the words being uttered. Kind of like karaoke, but for stories. Don't know how useful that is for a child that knows not how to read, but I would assume that for first graders it can be okay, as it can help them remember the letters after they've been acquired. Anyway, the interactivity is scarce and very simple, as this is more of a story with pictures and an extra animated cast of characters to listen to it, so your child will feel like he's got some company, maybe. I don't know, I find more interactive edutainment games more okay, really, such as Where in the World is Carmen Sandiego?, but I guess there must be something about these story based edutainment games as well.